While Vivaldi was composing away in Venice, another composer was ­turning heads in Germany and England: George Frideric Handel (1685–1759). He too had a great influence on the direction that music took during and after his lifetime. Keep reading to get a handle on Handel. George Frideric Handel, composer of Messiah and other great oratorios. Handel (it’s actually pronounced “HEN-dle,” but many people say “HAN-dle”) was born in Germany and trained in Italy. Which explains, of course, why he’s considered to be one of the greatest of the English composers. Try not to think too hard about this one. Actually, there’s logic here. 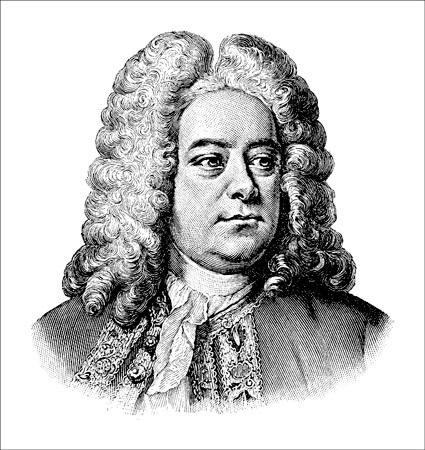 Handel was the son of a German barber-surgeon (not the kind of guy you’d want to do your tummy tuck). With dad spending his days removing one vital body part after another, it’s no surprise that the young George Frideric took up the organ. At 18, he left home for the big city — Hamburg, where he found work as a composer and performer. Handel knew that Italian opera was going to be the next big thing in Europe. And so, at age 22, he went off to Italy to learn how to write in the Italian style. He got to meet the superstar composers of the day — including Antonio “Xerox machine” Vivaldi, whose concertos he emulated. After a stint back in Germany, Handel ditched his homeland and moved to London. Handel wrote 36 operas in England, many of which were masterpieces of their kind. But public taste was changing. The trend of the day was musical entertainment based on the Bible. Handel obliged; he started writing oratorios — pieces for solo singers, chorus, and orchestra, usually with words taken from the Bible. The most famous of his oratorios was Messiah, first performed in 1742. Talk about a mega-hit: Messiah became so popular that gentlemen were encouraged to attend performances without their swords, and ladies without their hoops, so as to make more room. Handel, for all his musical talent, was famous for his explosive temper. News of Handel’s irritability got around in musical circles, and he became a prime target for practical jokes. It was well known, for example, that Handel couldn’t bear to hear the sound of instruments tuning up. So whenever he was to conduct a concert, he ordered that all the instruments be tuned before he even showed up at the theater. One evening, a prankster snuck into the theater and untuned all the instruments before the concert began. As Handel started conducting, what the audience heard was the screeching, dismal, harsh cacophony that only 50 out-of-tune instruments can produce. Handel went ballistic. In a rage, he grabbed an enormous double bass and tipped it over; then he picked up a kettledrum and, with all his might, lobbed it at the first violinist. In the frenzy, his wig came flying off, and the audience burst into uncontrollable laughter as Handel stormed off the stage. In 1749, Handel composed the Music for the Royal Fireworks to commemorate the signing of a treaty with Austria. The first performance was one of the greatest disasters in all of music history. For this special occasion, the king hired an architect to build a huge backdrop for the concert, which was to culminate with a spectacular fireworks display. The architect obliged with a building 400 feet long and 100 feet high, crowned with an enormous sun on a 200-foot pole. The whole thing looked like the set for an Andrew Lloyd webber musical. When the day came, Handel himself began conducting the piece. Everything went great for the first half of the piece. And then the fireworks began. Handel was probably annoyed enough that the fireworks were shooting off during his lovely music. But to make matters worse, some of the fireworks landed on the brand new building, which responded the only way it knew how: by catching fire. The crowd panicked, running for their lives as Handel doggedly continued conducting. Handel was livid. He had a notoriously explosive temper, so he likely provided the king with a display of private fireworks the next morning. Handel’s compositions are some of the best examples of the Baroque style. They’re fresh, spirited, often dancelike, and often emotionally charged. Amazing, considering Handel’s speed; he composed his famous Messiah oratorio — which lasts more than two hours and is sung in major cities worldwide every Christmas and Easter — in about three weeks.